(Sporting Alert) — FC Porto stunned Bayern Munich 3-1 in their UEFA Champions League quarter-finals first leg on Wednesday night. Check out the video highlights below. Poor defending from the opening minutes were the biggest problems for the German giants, who found themselves down 2-0 inside the opening 10-minutes. Manuel Neuer pulled down Jackson Martínez inside the penalty area in the second minute after Xabi Alonso was robbed of the ball and Ricardo Quaresma fired FC Porto into the lead from the penalty spot from the resulting foul. Minutes later Quaresma made it 2-0, following another defensive error, this time by Dante, who got caught in possession, allowing the ball to slip under his foot for the Portugal international to finish past Neuer. Bayern pulled a goal back through Thiago Alcantara before halftime, but Martínez made sure his team took a big advantage heading to the German capital by netting a third for Porto in the second half. And yes, the goal came from another defensive Bayern Munich mistake, this time it was by Jerome Boateng. “We always want to build from the back and this style can be dangerous. We can’t make any accusations though. Mistakes happen,” Bayern Munich captain Philipp Lahm said after the defeat. “We were looking good when we pulled a goal back, but when Porto made it 3-1, that really hurt us. In the night’s other game, Luis Suarez highlighted Barcelona’s 3-1 victory over Paris St-Germain on the road to put one foot into the semi-finals. PSG played without leading forward Zlatan Ibrahimovic, who is suspended after his card at Stamford Bridge against Chelsea. 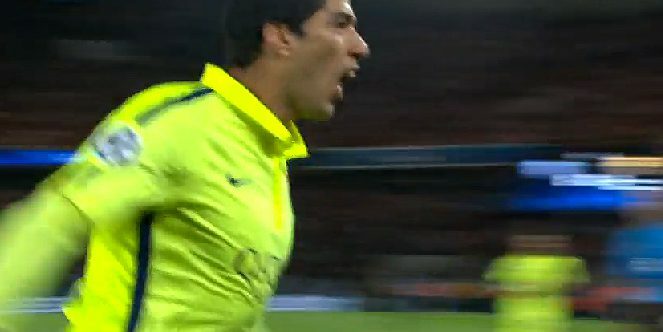 Neymar scored the opening goal in the first half before the Suarez show began. The former Liverpool forward nutmeg David Luiz twice and scored on both occasions for his brace in the second half. “We weren’t overly dominant. We played intelligently, and worked hard,” the Barcelona forward said. “When you play against an opponent like them you have to play with intensity to get the win. We knew we had to win. Jeremy Mathieu scored an own goal for PSG, who also saw striker Edinson Cavani going very close to pulling another goal back late in the second half.